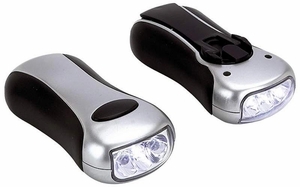 Mitaki-Japan� Two 3-Bulb LED Flashlight Set with two brightness settings features 60 seconds of winding to provide approximately 2 hours of power or you can use 2 AA batteries (not included). Each flashlight measures 4-1/4" x 1-7/8" x 1". Clam packed.